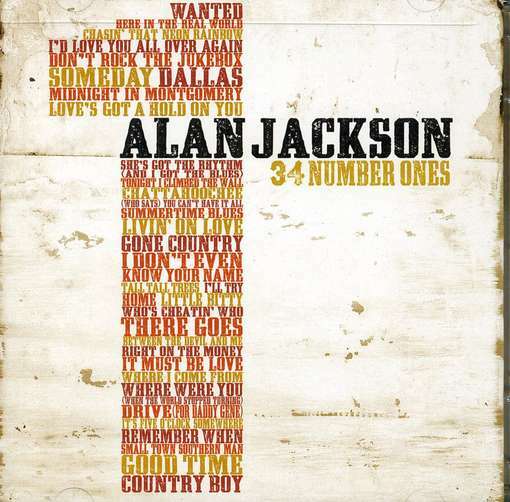 34 Number Ones is a greatest hits album by American country artist Alan Jackson. It was released in the United States on November 23, 2010 through Arista Nashville. The release celebrates Jackson's 20-year anniversary since the release of his debut album. As of the chart dated February 26, 2011, the album has sold 200,131 copies in the US. The release includes all of Jackson's number one hits on various trade charts, from his first, "Here in the Real World", to his latest, "Country Boy". Included in the release is his cover of Johnny Cash's "Ring of Fire" and Jackson's late-2010 duet with Zac Brown Band, "As She's Walking Away".